Autumn comes with harvest time, with gathering in, with thinking of home and sharing. There are people who may not be doing that this season. There are -- through the past and in the present time -- people who are immigrants or refugees by circumstances they control and ones they don't. Perhaps you know some of these people; perhaps immigration stories are embedded in your family history. Maybe not -- maybe you've seen images or read history books. Perhaps, though, there has been a time in your life when a helping hand or a listening ear was what you needed most, when you've been in a situation in which all felt strange. There are, and always have been, many stories about refugees and immigrants, and many ways to tell them. Here are several. Moira Smiley's experience with refugees and migrants was immediate and immersive -- the singer and composer volunteered with a group which went to the Jungle refugee camp in Calais, France. "I woke to culture and language completely beyond my understanding, and also the simple power of humans making beauty together - from nothing," Smiley says. "It's an honor to be with people when they have a life-or-death need for 'perspective' - that perspective mostly gotten through tenacity, openness and wit. Through these people who had become refugees, I understood how deeply connected we billions of humans are, and how little we may know of each other. "I walked in fear for the first hours in the Calais Jungle," she continues. "Could I be chewed up by the sharp-eyed need and anger I'd heard about? Being with my EAR (Expressive Arts Refuge) team showed me how to invite trust - mostly through music - while guiding ourselves through conflict." One of the results, for Smiley, was her song Refugee. She sees it as a song about being bereft and misunderstood -- which it is -- but there are also threads of hope, of trust, and of connection in the song. It is also, she remarks "[an] un-sentimental plea for compassion. I have some hope that a resolute song can touch our hearts and change us." Smiley is working on her next solo album. In the meantime, listen for her singing on Jayme Stone's Folklife, with whom she will also be touring in the coming months. 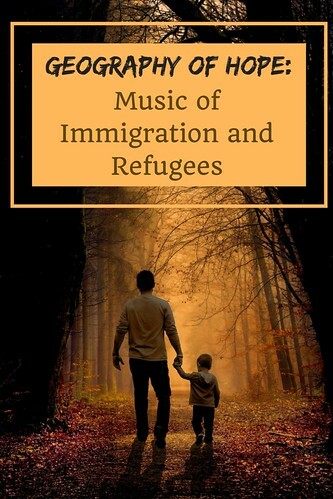 If you follow this link to purchase a download of the song, proceeds will go to an international organization which works with refugees. Elias Alexander found his way into his calling to music one day taking a break from planting trees. while he was sitting beside a stream. Alexander grew up in the United States but his family roots reach back to Scotland, which is where that stream was. He sketches a bit of family history and an effect of immigration through the generations in his song Earth and Stone. It is recorded on the album Bywater, by Elias Alexander and the Bywater Band. Whether refugees or immigrants, where people end up sometimes has little to do with the formalities of borders or papers. At times that's because they find refuge with family and friends, at other times it's about finding a stopping place, a place that seems safe -- even if documents don't always go along. Cathie Ryan tells the story of such a situation from the perspective of undocumented Irish immigrants. Ryan wrote the song more than twenty five years ago, when she was lead singer with the band Cherish the Ladies. This is a vintage clip of Ryan singing the song with Cherish. You may find the song on the Cherish the Ladies album called The Back Door. Ryan, who has gone on the a flourishing solo career, still sings the song in concert at times. Ryan's most recent solo recording is called Through Wind and Rain. Cherish the Ladies is still going strong too, with founding members Joanie Madden (on whistle and flute in this video) and Mary Coogan (on guitar) still anchoring the group. Cherish the Ladies has recently released the album Christmas in Ireland. Living most of her life in Texas and New Mexico, Tish Hinojosa knows well the stories of many immigrants and migrants, too, and has often written about aspects of this life in her music. Here she is with a family story, West Side of Town. This is a bit of a vintage clip too, but Hinojosa often does the song in concert and you may find it on her greatest hits and live albums, and on the album where she first released it, which is called Homeland. Rhiannon Giddens grew up in North Carolina listening to all sorts of music from country to classical to pop. She went on to study opera at Oberlin, joined a band singing Celtic music, and then became founding member/singer/fiddler/banjo player of the Carolina Chocolate Drops. The Drops' focus on old time string band music won them a folk music Grammy. The song We Could Fly comes from Giddens' second solo album Freedom Highway, a project which speaks of the African American experience in many voices. We Could Fly draws on a legend common in slavery times, that people at the time of death would fly back to their homelands in Africa. It is a story Giddens and producer Dirk Powell have threaded with present day hope. To bring the threads of of these ideas together, another song from Rhiannon Giddens, one she has not as yet recorded on an album, but that you will recognize. BBC Northern Ireland commissioned Phil Cunningham (he plays accordion on this clip) to host a series tracing musical connections among Scotland, Ulster, and North America. The series is called Wayfaring Stranger, as is the song.